This May 24, 2017, file photo shows Secretary of Education Betsy DeVos testify during a hearing before the Labor, Health and Human Services, Education and Related Agencies Subcommittee of the House Appropriations Committee on Capitol Hill. 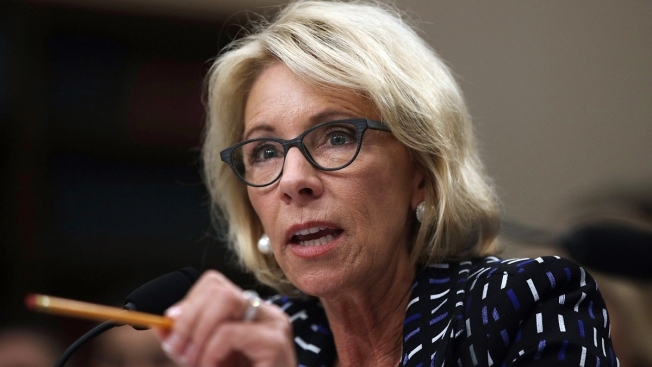 Education Department officials opened formal negotiations on Monday to rewrite federal rules meant to protect students from fraud by colleges and universities. The talks with university representative and student advocates are taking place as the department faces criticism for delaying consideration of tens of thousands of loan forgiveness claims from students who say they were defrauded by for-profit colleges. The 1994 rule, known as borrower defense, allowed loan forgiveness if it was determined that the college had deceived them. But the rule was rarely used until the demise of Corinthian and ITT Tech for-profit chains several years ago, when thousands of students flooded the department with requests to cancel their loans. In 2016, the Obama administration passed revisions to the rule, which clarified the process and added protections for students. DeVos froze those revisions until new rules can be written. Student advocates hope to put in place additional checks on schools to prevent them from acting dishonestly. For-profit colleges say the Obama changes were unfair to schools and hope for a more balanced approach this time. Some of the key issues to be addressed are what standards of evidence to use when evaluating students' fraud claims; whether colleges should reimburse students for their loans in case of fraud; and whether schools can make students sign away their rights to sue them. 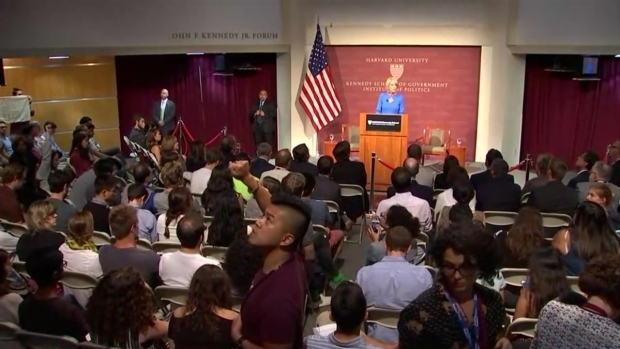 Protesters abounded as U.S. Secretary of Education Betsy DeVos spoke at Harvard's Kennedy School of Government Thursday evening. Annmarie Weisman, a representative for the department, said the starting point for the negotiations Monday will be the initial 1994 rule, not the Obama revisions. 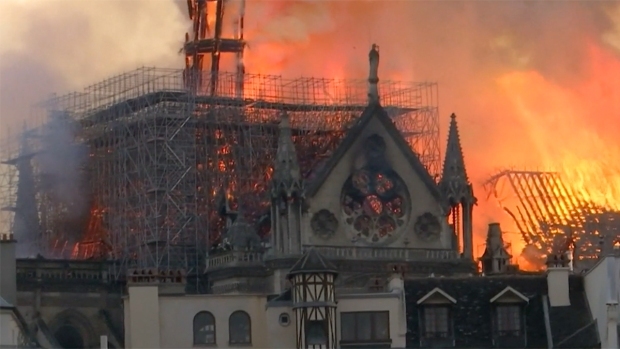 As the negotiations kicked off, department officials sparred with advocacy groups about whether the event would be live-streamed. More than five hours into the discussions, a decision was finally reached to allow audio recording instead of live-streaming. The Education Department has accumulated a backlog of some 87,000 loan cancellation claims, according to a report published this week. The Associated Press reported last month that DeVos is considering abandoning the Obama administration practice of fully erasing student loans and instead granting defrauded students only partial relief. DeVos has hired Robert Eitel as her senior counselor. Eitel served as a top lawyer for Career Education Corporation, an umbrella organization for SBI. She also appointed a former dean at DeVry University to serve as head of the department's enforcement unit. Meanwhile, earlier this year, President Donald Trump paid $25 million to settle charges that his Trump University misled customers. DeVos says she is intent on protecting students' rights, but says the Obama regulations were too lax and could allow for some applicants to abuse the system. The discussions started a day after the department was named in a lawsuit that seeks to provide a new legal remedy for tens of thousands of students frustrated with the department's inaction on claims seeking loan forgiveness. The graduating class of 2017 booed and turned their backs on Secretary of Education Betsy DeVos during her commencement address at historically black Bethune-Cookman University. DeVos delivered the address despite weeks of protest from students, Bethune-Cookman alumni and local NAACP leaders. Tina Carr and Yvette Colon had attended Sanford-Brown Institute, a for-profit college in New York, and are seeking to have their student loans erased. Their lawsuit cites federal and state law that prohibits fraud as well as the contract they signed with their school. Previous lawsuits invoked the department's own regulations in their search for loan relief. Colon completed the school's certificate program to work as a cardiac sonographer, only to learn that her credentials were invalid and that she couldn't transfer her credits to other schools, as had been promised, according to the suit. Colon is asking for the cancellation of her four federal and two private loans totaling $21,000. Carr trained to be a medical assistant. She says the school lied to her about job placement assistance and the ability to transfer credits. Carr has defaulted on her $14,500 federal loans and wants the loan forgiven. "People's rights not to pay for defective products is well established in law, so whatever the Department of Education is or is not doing, the legal rights of borrowers continue to exist and are enforceable against the government just as they are against private parties," said Toby Merrill, a litigator at Harvard University's Project on Predatory Student Lending, which represents defrauded students. "Yvette and Tina deserve to be able to move on with their lives, and because it's clear that the department doesn't have any intention for doing anything for cheated students, it's necessary to bypass them and go straight to the court for their fair hearing," she added. The department did not respond to a request for comment, nor did Career Education Corporation, which operates Sanford-Brown Institute. Navient, the loan servicer named in the suit, said it doesn't have the authority to decide the fate of student loans. In 2013, the school reached a $10 million settlement after an investigation by the New York attorney general found that the school routinely misrepresented its job placement results to students. It has since then shut down all of its brick-and-mortar campuses, but still operates online. Career Education Colleges and Universities, the for-profit industry lobbying group, also did not return a request for comment.